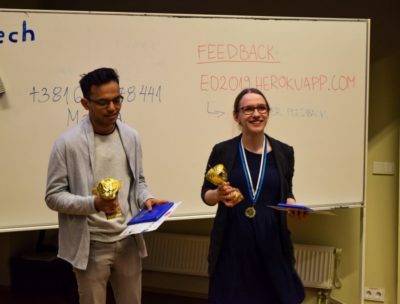 The team Sweden and East-Sweden (Mohit Singh, Milla Huuskonen; Jönköping/Helsinki) has won the Estonian Open 2019. Out of Opening Opposition, they defeated Toore lehm + kana embrüo (Carl-Martin Keerberg, Erik Haamer; Tartu) in Opening Government, Triin is not funny (Triin Toimetaja, Alexander Chen; Copenhagen) in Closing Government and The Dark Knife Rises (Johan Allen, Meradjuddin Khan Oidermaa; Stockholm) in Closing Opposition on the motion “TH prefers a world in which the prevailing norm is one of serial monogamy rather than monogamy (incl. infoslide)”. The final was judged by a panel of Milos Marjanovic (chair), Klaudia Maciejewska, Marta Vasic, Mateusz Wójtowicz and Przemek Stolarski. In the novice final, Closing Government Spooky Scary Schoolies (Riya Tagra, Andreas Backman) took the victory against the Opening Government 🔥💯💯👌👀😂🔥 (Anton Granath, Maïlys Anne Raphaëlle de Colnet), Opening Opposition Titillating Utility (Andrew Mabon, Luca Stroppa) and Closing Opposition Let It Be (Rūdolfs Rūdis Ziedonis, Kristiāna Kalniņa). The teams debated the motion “THBT liberal states should sponsor the hacking of infrastructure designed to limit freedom of speech in authoritarian states”. The adjudication panel consisted of Mateusz Wójtowicz (chair), Heleriin Ots, Martin Küüsma, Milos Marjanovic and Pierce Ricketts. Best speaker of the tournament was Johan Allen with an average of 80.00 speaker points. Andrew Mabon topped the novice category with 76 speaker points on average. 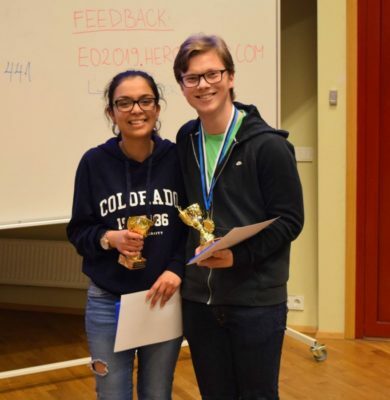 The tournament was convened by the University of Tartu Debate Club. The CA team consisted of Milos Marjanovic, Huyen Thi Thanh Nguyen and Benji Kalman. Ronja Soopan was responsible for the tab. R1: Infoslide: Lay judges’ are members of the public who act as judges in minor legal issues, e.g. petty theft, vandalism, criminal damage and drink driving. They are not required to have any formal legal training but are required to be from the local community, to be of good character, to have good communication skills. and to be reliable. F: Infoslide: Serial monogamy is a mating practice in which individuals may engage in sequential monogamous pairings.